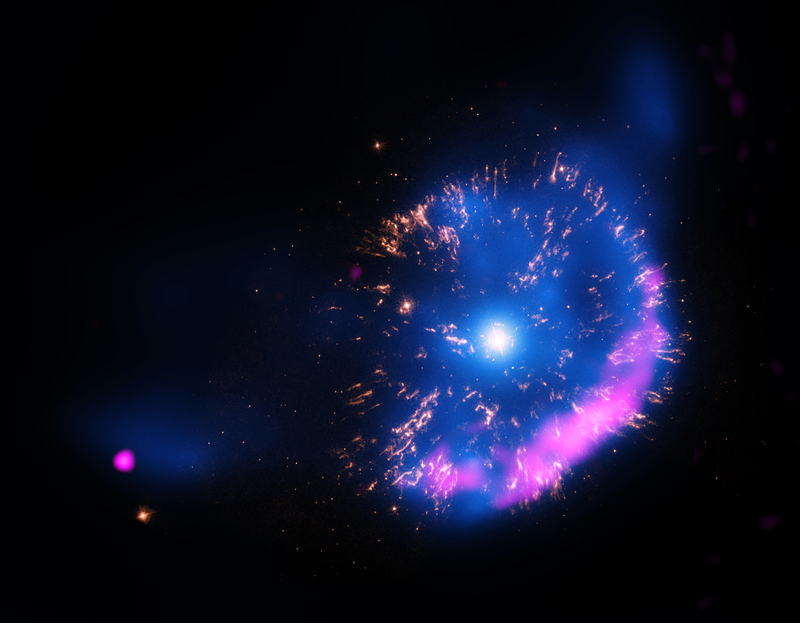 GK Persei is a "classical nova," an outburst produced by a thermonuclear explosion on the surface of a white dwarf star. Classical novas are considered to be miniature versions of supernova explosions. Astronomers used Chandra to observe differences in GK Persei over a span of nearly 14 years. 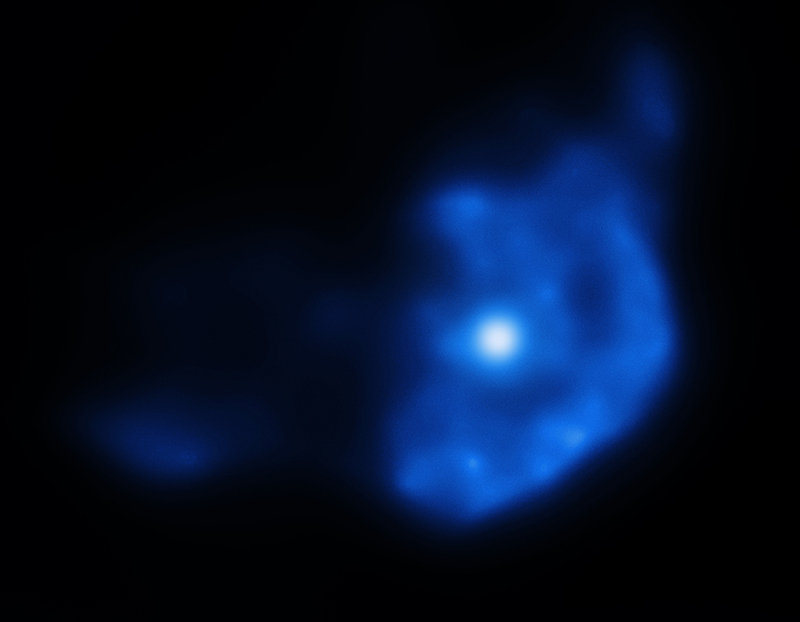 A new image of GK Persei contains X-rays (blue), optical data (yellow), and radio data (pink). A paper describing these results appeared in the March 10th issue of The Astrophysical Journal. The authors were Dai Takei (RIKEN, SPring-8 Center Japan), Jeremy Drake (Smithsonian Astrophysical Observatory), Hiroya Yamaguichi (Goddard Space Flight Center), Patrick Slane (Smithsonian Astrophysical Observatory), Yasunobu Uchimaya (Rikkyo University, Japan), Satoru Katsuda (Japan Aerospace Exploration Agency). Coordinates (J2000) RA 03h 31m 11.80s | Dec +43° 54´ 16.80"
Observation Time 53 hours 32 min (2 days 5 hours 32 min). Where is the matter get a chance to get together. The gravity in there increases. One star's energy will maintaining and increasing by the gravity.� That means for preparation of energy a pressure is needed.� If the size of the star increases the power to produce energy also increases.� That is why we can't see the stars in the size of planets and also like that in black holes it need a decided quantity of gravity. If Neutron stars size is less but �the mass equal to the sun. I am requesting information regarding the physical properties that the various colors represent, elements, etc. Thank you. This is the best short explanation of novas that I have come across. It will be a great teaching aid in my adult education class. Although 13 years is very short in astronomical terms it certainly has yielded some long term insights. Sir I am still student in this science. I appreciate your efforts. To me, day by day, I find my self always in need to more understand our complex UNIVERSE. X-rays from the Chandra, optical data from Hubble and radio from National Science Foundation's Very Large Array. X-rays are blue, optical are yellow and radio are pink.